Jabali is a private nature reserve with spectacular views over Mpumalanga. Only 70 km from Pretoria, it is accessible and easy to reach by tar road. Jabali offers the most spectacular horse trails encompasing wetlands, mountain and grassland. Bring your own horse and tack or saddle one of our reliable, well trained horses. Our professional grooms will care for your horse as if it`s their own while you stay in a luxurious five star Canadian Log Cabin. Jabali is of great historical importance. During the Boer war the English and Boers battled it out at Rhenosterkop. You will find all kinds of interesting artifacts around the mountain. Visit the graves of the English and the Boers and follow in the footsteps of the early pioneers. At Jabali you will stay in a luxurious 5 star Canadian Log Cabin designed for your comfort and pleasure. The cabin has 2 bedrooms, lounge and open plan kitchen with a loft that sleeps two people. The log cabin sleeps a maximum of 6 people. The log cabin has it's own private veranda with stunning views. 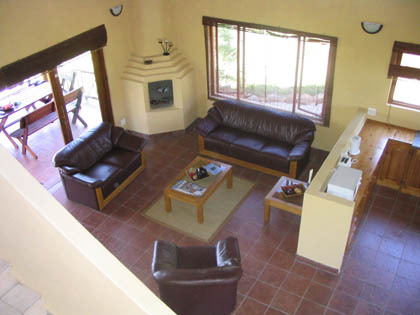 Luxury, comfort, quality and service is what you can expect at Jabali! There are many different ways that you can enjoy yourself at Jabali. Although Jabali is primarily a horse riding destination, there are many other ways to enjoy yourself. Jabali has more than 34 km road to travel by horseback or mountain bike. If you prefer the less formal roads and require a more difficult and challenging route, then you can follow the myriad of paths that crisscross Jabali. Jabali has a clear pool that you can laze in for hours or you can even enjoy a dip in the warm dams. Our mountain is one of the best Para Gliding and Hang Gliding locations in South Africa. We can teach you to hang glide and you can enjoy the most spectacular views tandem jumping with professionals. Hang gliding is only available weather permitting.